Of the institutions of higher learning in late antebellum America, the College of New Jersey (officially renamed Princeton University in 1896) was unique in its mix of young white men from North and South and from middling and elite backgrounds. Southerners made up 66% of the class of 1790, and exceeded 60% multiple times through the antebellum period. Friendships among collegians, though initially formed with those from similar cultural groups, commonly extended to classmates from different backgrounds and transformed over the course of four years into something new: intimate male friendships. 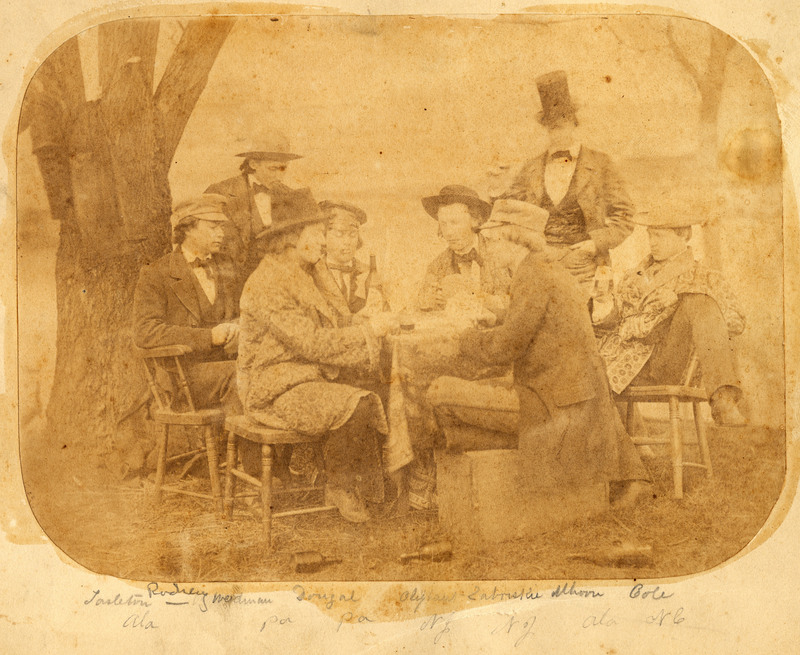 Northerners and Southerners from the class of 1859 playing cards and drinking port. Students from both sections relished the possibilities of their close college friendships. For southern students, a new kind of emotional language was made available to them, one not easily accessed in the hierarchal society of the Old South. For northern students, increased contact with other students from their region as well as those from farther afield widened the range of possibilities for friendship with other young men. At Princeton before the Civil War, the bonds formed by young northern and southern men largely overcame the anxieties and dichotomies of a fraught nation, forming what educational historian Roger Geiger has called “a distinctive social regime.” The onset of war, however, resulted in the ultimate dissolution of these same friendships. 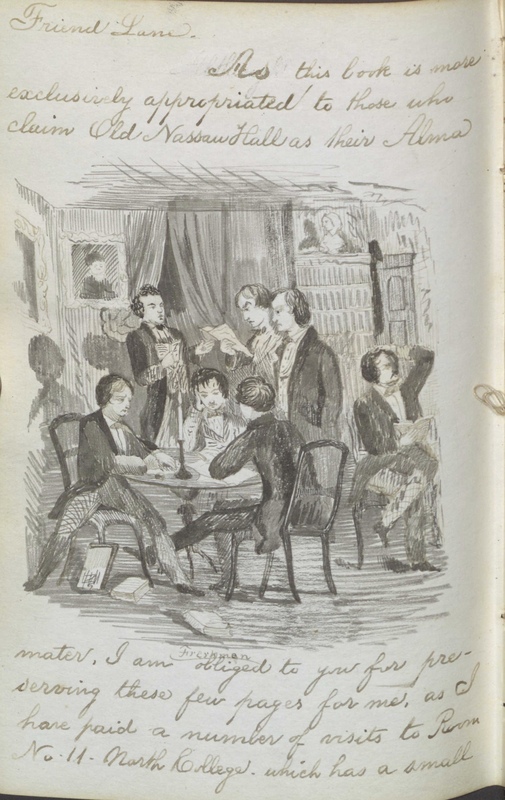 Antebellum students’ own words—as recorded in dozens of surviving autograph books—present a fascinating portrait of intimacy, conviviality, and friendship among collegians. Their messages to each other offer a glimpse into this antebellum world, one at once very different from and deeply familiar to the college experience of Princeton students today. Autograph book entry by R. McC. Shepherd to William B. Lane ('1861), with sketches of "college life." Students’ autograph books are among the most interesting artifacts to survive from this distinctly cross-sectional antebellum moment at Princeton. A survey of the collections at Princeton’s Mudd Library has found that autograph books from the 1850s onward were typically “gold-stamped or blindstamped brown, dark blue, or red imitation leather over hard covers with approximately 125 gilt-edged leaves of white or light paper.” The autograph books’ construction reflected aspects of the students’ youthful standing in life—the imitation leather of the covers points to their pecuniary limitations, while the gilt-edged leaves and gold stamping convey the importance of the content inside. Although better constructed than unbound scrapbooks, autograph books lacked the elegant construction of society guest books or family registers. The students’ entries belied their poor construction, however. Some of the title pages, for instance, are beautifully lettered with illustrations and poetry. Autograph books primarily served to allow each member of the class to sign his name and write a short departing note, often at graduation time. The inscriptions most often followed convention: students simply signed their names and passed the book along. Others added a short personal note with best wishes for the future before moving onto the next entry. Compared to diaries or unpublished journals, autograph books were not private—they circulated widely, as each student hoped to obtain the complete set of signatures of his classmates. In the 1850s, autograph books were “all the rage,” class of 1853 alumni Henry Scharff and James Buchanan Henry wrote. By the middle 1850s, autograph writers occasionally included ambrotype or tintype portraits with their entries. 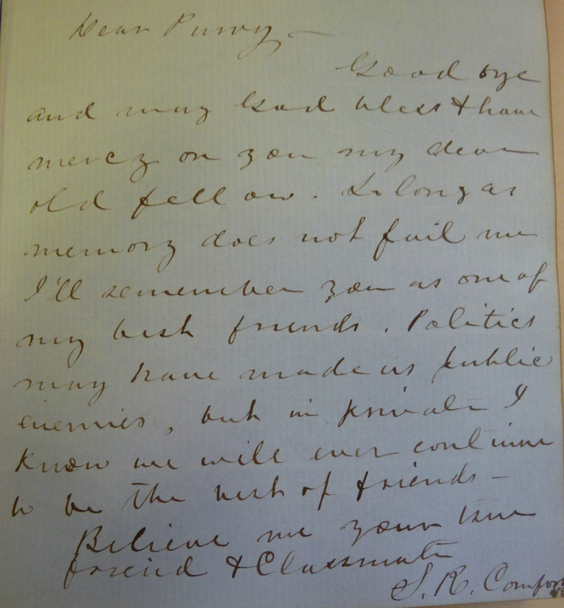 Autograph book entry of Roland Cox (class of 1863) to Ewing Graham McClure ('1862). Although they were the exception rather than the rule, some students carefully inscribed farewells to one another that reflected on the significance of their past four years of college life. In these instances, autograph writing became an intimate experience and autograph books a record of shared friendships. For those who engaged in this sentimental act, the pages of each book were blank canvases with limitless possibilities for expression. Despite limitations on privacy, students found ways to express the intimacy that they shared with each other. In their messages to each other, young men transformed their “college days” into “the happiest days” of their lives. Autograph books were not only records of intimate experiences; they were also meant to be reminders, almost memorials, of the past. They were at once an admixture of shared personal reminiscences and a public statement about the meaning of friendships at a particular moment in their lives. Princeton was not unique in its autograph culture. Other exclusively male schools—notably Bowdoin, Dartmouth, Harvard, Brown, and Yale—followed similar patterns, as did the all-female Mount Holyoke College in Massachusetts. But the mix of students from both North and South meant that the autograph culture at Princeton was uniquely cross-sectional. After the first shots of the Civil War were fired, autograph books increasingly revealed the sectional divisions between classmates. Florida native Andrew Anderson (‘1861) focused his message to New Jersey classmate John Runkel Emery (‘1861) on the lack of intimacy in their friendship—perhaps due to their different regional backgrounds. “Although I have never been intimate with you,” Anderson wrote, “yet had circumstances thrown us together I’ve no doubt we would have been very good friends.” John Peter Jackson Jr. (‘1856), another Jerseyman, confessed to North Carolinian Frederick Cox Roberts: “I have always regretted [we] could not have been more intimate,” unsurprising given that the two men did not share similar fraternity or literary society connections. Let me assure you, my dear fellow, that my friendship for you has almost ripened into affection; if such a thing is possible between male and male, it has quite done so. 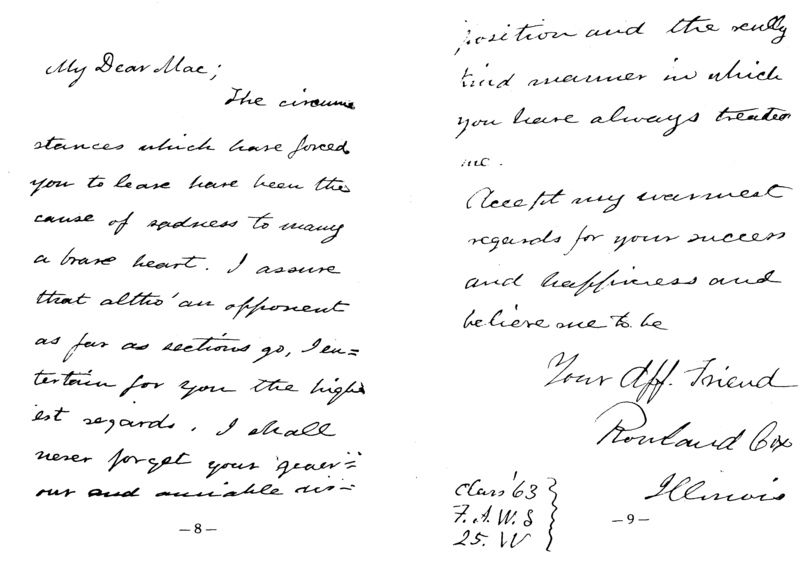 Five months later, while on campaign near Centreville, Virginia, Coffin wrote his mother a poignant letter. He described meeting a “classmate of mine,” who was “a N. Carolinian and belongs [to] the Regt. of cavalry from that sight,” adding “of course it does me good to meet up with those who were my friends and classmates.” The bonds of affection formed at college between Hugh Martin Coffin and his classmates proved to be the most intimate of his short life—he died on December 5, 1861, in service of the Confederate army. William H. Canfield's (class of 1850) message in Robert Bolling's ('1850) autograph book. For three years we have been classmates and firm, strong friends. We have lived and loved together during this time. We entertain similar opinions on a great many things. Those Jack were halcyon days, the only time when mortal man can truly enjoy himself is just between the years of fifteen and twenty, and as that period of my life has been in a great measure associated with you (and you being a jolly good fellow as we all know), of course I must have in a great degree received my highest enjoyment at your hand. The friendships of young men like Cochran, Haight, and Stryker relied to a great deal on being “jolly fellows,” which implied a good deal of drinking, carousing, and practical joking. Perhaps, as some autographs suggest, they included a measure of superficiality that the young men could not recognize for themselves. 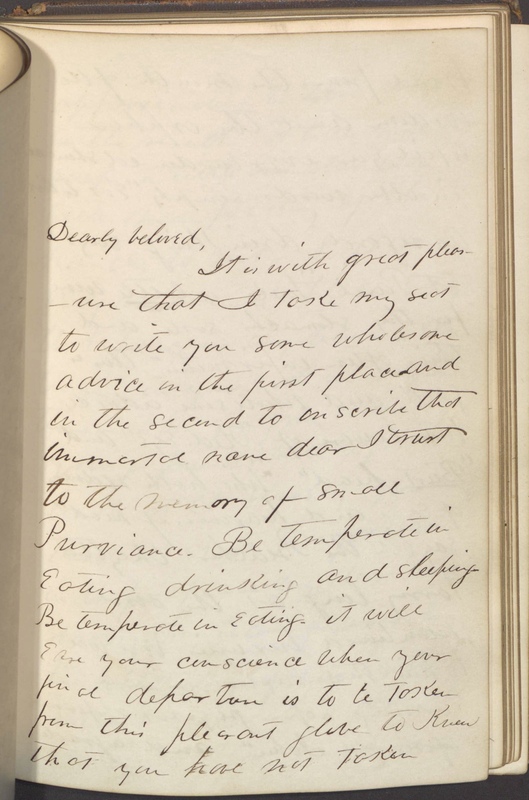 Autograph book entry by James R. Yerger ('1859) to Winfield S. Purviance ('1861). Tonight there came near being severe fights between Secessionists and loyal men . . . [a] knife was drawn by [a] fellow from Baltimore but [the] approach of [the] President prevented serious consequences. Thus only, I believe, was bloodshed averted. What did the intimate language used in autograph books by young men mean in the context of 19th-century America? In one sense, their autograph book entries were not particularly unusual. The description of their friendships and shared experiences, and their lamentation at parting, can be read as a fairly typical, if nostalgic, evocation of an idyllic past—a tone common to autograph books of the period (and later such entries in high school and college yearbooks). Yet the entries were unusual for young men in the antebellum period in other ways. The students who reflected on their shared experiences were speaking directly to the nature of intimate male friendships. The language used in autograph books formed part of a discourse of intimacy among young men, similar to the discourse that has been widely observed among women at this time. The autograph book may be read as an attempt to capture the memories of shared intimacy and even to continue them past the college years—quelling future anxieties through the backward glances taken together in friendship. Many students signed their classmates’ autograph books with deeply felt sentiment, intense longing, and a passionate desire for sustained future relationships. For others, the special intimacy of close male friendships during college had ended and the need to accept the reality of future occupations, responsibility, and family had arrived. When they signed their names, they left behind a reflection of the semi-permanent nature of college life and their aspirations for the future. Their autograph books memorialize the shared, if fleeting, lives spent together at Princeton. Seeley G. Mudd Manuscript Library at Princeton University holds 196 autograph books from 170 alumni who graduated between 1825 and 1884. Finding aid available at: http://findingaids.princeton.edu/collections/AC040. 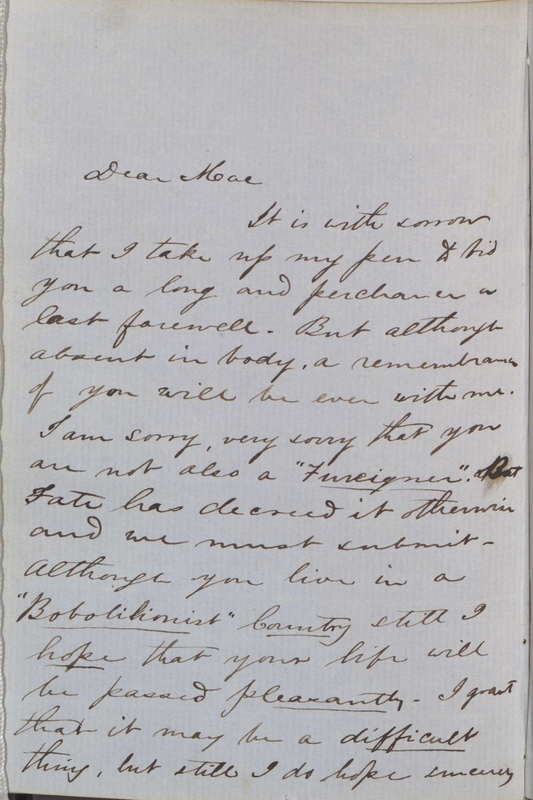 For the letter of Hugh Martin Coffin to his mother, date November 16, 1861, see Coffin Family Papers [bMS Am 2046 (24)], Houghton Library, Harvard University, available digitally at: http://oasis.lib.harvard.edu/oasis/primo?id=hou00337. Balcerski, Thomas J. “‘Under These Classic Shades Together’: Intimate Male Friendships at the Antebellum College of New Jersey.” Pennsylvania History. Vol. 80, no. 2 (spring 2013): 169-203. Bates, Alice L. “Autograph Albums of the 1860s.” Manuscripts. Vol. 50 (1998): 269-79. Clark, Alexander P. “‘Princeton Memories with a Golden Sheen’: Student Autograph Albums of the Nineteenth Century.” Princeton University Library Chronicle. Vol. 47 (1986): 301-16. Henry, James Buchanan, and Christian Henry Scharff. College as It Is; Or, the Collegian’s Manual in 1853. Ed. Jefferson Looney. Princeton, NJ: Princeton University Press, 1996. Kerridge, Ronald. “Answering ‘The Trumpet of Discord’: Southerners at the College of New Jersey, 1820-1860, and Their Careers.” Senior honors thesis, Princeton University, 1984. McNeil, William K. “The Autograph Book Custom: A Tradition and Its Scholarly Treatment.” Keystone Folklore Quarterly. Vol. 13 (1968): 29-44. Norris, Edwin M. The Story of Princeton. Boston: Little, Brown, 1917. Oppenheim, Roy D. “The House Divided: Princeton University during the Civil War.” Senior honors thesis, Princeton University, 1980. Zboary, Ronald J., and Mary Saracino Zboray. Literary Dollars and Social Sense: A People’s History of the Mass Market Book. New York: Routledge, 2005. Roger L. Geiger and Julie Ann Bubolz, “College As It Was in the Mid-Nineteenth Century” in The American College in the Nineteenth Century (Nashville, TN: Vanderbilt University Press, 2000), 82. “Finding Aid.” Most of the books in the collection were donated by the original owners’ descendants. James Buchanan Henry and Christian Henry Scharff, College as It Is. Or, the Collegian’s Manual in 1853, ed. Looney (Princeton, NJ: Princeton University Press, 1996), 248. Emery, John R; 1861; Autograph Book Collection, Box 19; Princeton University Archives, Department of Rare Books and Special Collections, Princeton University Library. Roberts, Frederick C; 1855; Autograph Book Collection, Box 8; Princeton University Archives, Department of Rare Books and Special Collections, Princeton University Library. John Tyler Haight Scrapbook, 1862, Scrapbook Collection, Princeton University Archives, Department of Rare Books and Special Collections, Princeton University Library. Cited in Kerridge, “Answering ‘The Trumpet of Discord,’” 82–83. Entry of September 16, 1860, William E. Potter Diary, 1859-1862, Princeton University Archives, Department of Rare Books and Special Collections, Princeton University Library. Theodore W. Hunt, “College and Civil War Reminiscences,” Princeton Alumni Weekly 17 (May 23, 1917): 760–61; Norris, The Story of Princeton, 186.